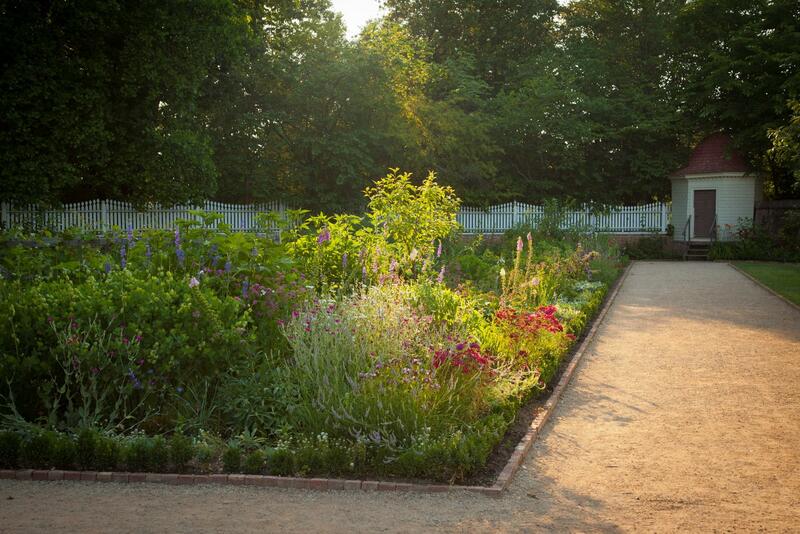 Join leading gardeners, historians, horticulturalists, archaeologists, and preservationists as they reconsider the importance of gardening, landscapes, and design in early America. Learn how Washington and his contemporaries shaped the natural world to achieve beauty through gardening, profited through agriculture, and conveyed civic values through landscape design – and how these historic methods remain relevant in today’s world. Revisit long-lost gardens, explore contemporary creations inspired by the past, and come face-to-face with the most authentic 18th-century plantation landscape in the United States. The Mount Vernon Symposium is endowed by the generous support of The Robert H. Smith Family Foundation, Lucy S. Rhame, The Felicia Fund, The Sachem Foundation, and Mr. and Mrs. Frank Mauran IV. All lectures take place in the David M. Rubenstein Leadership Hall in the Washington Library. While colonial and federal-period Virginia gardeners like Washington, Jefferson, the Lees, Carters, and others embraced the naturalistic forms of the English landscape movement, they did not abandon geometric relationships passed down from the Middle Ages. Such proportional systems relied not on mathematical calculations but on geometric relationships between the parts that created a harmonious whole. As in Europe, this geometry created a bridge from the rigid patterns of designers like Dezallier d’Argentville to the “regular irregularity” of Langley, Brown, and Repton. These early Virginia landscapes reflect a sophisticated yet accessible approach to creating order out of chaos. William D. Rieley serves as the Landscape Architect for The Garden Club of Virginia, a position he has held since 1998. In that capacity, he works at the direction of the Restoration Committee to prepare plans for new projects the Garden Club undertakes and advises on projects previously completed where adjustments or new work is contemplated. Rieley & Associates Landscape Architects, PC was founded in 1980 and is privately held. Both immigrants and Native Americans contributed greatly to the beauty of Southern gardens. While new arrivals brought diversity and with it the fruits and flowers of many different cultural, economic, and religious traditions, Indigenous peoples brought a keen understanding of plants and nature and an eye for selecting best sites for communities and trails. Many émigrés also brought from their distant homelands a mental picture of what a garden ought to be. By exploring your own gardening roots, you can create a strong sense of place and sustainability by using time-tested design ideas and heirloom plants from the past. William C. Welch is Professor and Landscape Horticulturist for Texas A & M University. He writes about garden history and is the author of several popular references books, including Perennial Garden Color, Antique Roses for the South, The Bountiful Flower Garden, The Bulb Hunter, and The Southern Heirloom Garden. He is a leader in the movement to collect and reintroduce old southern garden favorites into the modern plant palette. George Washington oversaw every aspect of Mount Vernon’s landscape. He extensively redesigned the grounds, adopting the less formal, more naturalistic style. Washington reshaped walks, roads, and lawns; cut vistas through the forest; and planted hundreds of native trees and shrubs. Eighteenth-century visitors were delighted by bountiful offerings of fresh vegetables and fruits and reveled in after-dinner walks among all manner of opulent flowering plants. After this lecture, join Mount Vernon’s expert horticultural team as they lead guided tours highlighting Washington's brilliant design. Visit the gardens he created, see original trees, and learn how the General merged areas for work and leisure to create a master plan for his beloved home. Dean Norton is Director of Horticulture at George Washington’s Mount Vernon and has researched 18th-century landscape design and gardening practices for over 35 years. He has been instrumental in the restoration process of Mount Vernon’s botanical garden, fruit garden and nursery, many landscape features, and most recently the upper garden. He has received awards from numerous organizations and serves on the boards of several historic sites. Drawing inspiration from George Washington, America’s First Farmer, Forrest Pritchard provides a comprehensive overview of how a sustainable livestock farm using cattle, pigs, chickens, and sheep not only protects our environmental resources, but helps accelerate and restore depleted soils, all the while remaining profitable for the farmer. Pritchard will explain his practices with fascinating insider facts and observations. Forrest Pritchard is a full-time sustainable farmer and New York Times bestselling author, holding degrees in English and Geology from William & Mary. His farm, Smith Meadows, was one of the first "grass finished" farms in the country and has sold at leading farmers' markets in Washington, D.C. for fifteen years. Pritchard is also an accomplished public speaker and a frequent contributor to food and farming blogs. For several decades, the Mount Vernon Ladies’ Association has used the benchmark year of 1799 for landscape interpretation within the estate’s historic core. Efforts to restore the grounds and dependencies have been a paramount concern, but elements such as a colonial revival garden (1930s), relic house (1928), and porters’ lodges (c. 1818) survive. Along with these features, different generations of historic plantings of trees and shrubberies and associated gravel pathways exist from the designs of prominent landscape architects such as Charles Sprague Sargent, Morley Williams, and Rudy Favretti are extant. The challenges of working with a multi-temporal landscape as well as the possibilities this presents from an archaeological and interpretive standpoint are revealed in this lecture as well as the current efforts being undertaken for the historic grounds restoration. Luke J. Pecoraro is Director of Archaeology at George Washington’s Mount Vernon. He has worked in cultural resource management archaeology on a variety of prehistoric and historic sites and for several years as a staff archaeologist on the Jamestown Rediscovery project. Luke is also a research archaeologist for the First Colony Foundation searching for the 16th-century “Lost Colony” on Roanoke Island. Inspired by the British literature of agricultural improvement, Washington and King George III simultaneously undertook experimental agricultural projects that they hoped would serve as a model for the farmers of their respective nations. As they engaged in the practical work of crop rotations and integrated livestock management, Washington and the king also shared a determination to design farms that would reflect the Enlightenment ideals of the picturesque. The order and neatness of their farms were visible reflections of the rational principles of scientific agriculture. Drawing on images and documents in the Royal Collections, this presentation will explore George III’s pursuit of the picturesque farm prized by a transatlantic community of agricultural leaders, including Washington. Bruce Ragsdale has been a fellow at the Washington Library and more recently served as Mount Vernon’s inaugural fellow in the Georgian Papers Programme at the Royal Archives at Windsor Castle. His forthcoming book will explore Washington’s life as a farmer. Ragsdale previously served as the director of the history office at the Federal Judicial Center and as the deputy historian for the U.S. House of Representative. Central Park, like Mt. Vernon, has always been about how to perfect Mother Nature and make her work for the good of mankind. At Mt. Vernon, Washington sought efficient, sustainable agriculture on the model of the English landed estate. In Central Park, Vaux and Olmsted sought to provide city dwellers with a healthy and beautiful respite from urban stress. Both places, revered American pilgrimage sites, share a common British heritage. In this talk, Mr. Heckscher will recount how Calvert Vaux and Frederick Law Olmsted came to create their “Greensward Plan,” and then went on to overcame every imaginable obstacle to see it realized. Morrison Heckscher is Curator Emeritus of the American Wing at The Metropolitan Museum of Art. During his fifty-year career at the Metropolitan he specialized in 18th and 19th century American domestic architecture and 18th century American furniture. In 2008 in celebration of the 150th anniversary of the Vaux-Olmsted “Greensward Plan,” he published a history of the creation of Central Park. Kelton House Farm evokes a sense of place that celebrates America’s colonial history. The early eighteenth-century saltbox, originally built in New England’s upper Connecticut River Valley, was moved to its present location in rural Wisconsin. Today the house contains a collection of seventeenth and eighteenth-century American furniture and decorative arts surrounded by gardens featuring heirloom ﬂowers, herbs, fruits, vegetables, and pastoral landscape. The farm represents a particularly rich time for gardening when many native American plant varieties were being gathered by collectors and shipped to England to enhance the gardens of wealthy aristocrats. At the same time, many varieties of British and European plants found their way to America. Gardens of this period were quite practical, with most plants grown for medicinal or culinary purposes. This lecture will explore the gardens at Kelton House Farm, focusing on historic design and functionality. Joseph P. Gromacki is a Chicago-based attorney, collector of American decorative arts, and avid gardener with a keen interest in heirloom plants including herbs, fruits, vegetables, and flowers. He spends his weekends at a farm in southeastern Wisconsin, which features an early eighteenth-century farmhouse from New England and gardens of historic design. Joe is a trustee of the Art Institute of Chicago, the Terra Foundation for the American Arts, the Layton Art Collection, Historic Deerfield, and the Chicago Botanic Garden. Gabriele Rausse is the Director of Gardens and Grounds at Thomas Jefferson’s Monticello. A native of Italy, he was brought to Virginia to start Barboursville Vineyards. Between 1976 and 2012, he helped to start 45 vineyards and 14 wineries including Kluge Winery, White Hall Vineyards, Blenheim Vineyards, as well as his own winery, Gabriele Rausse Winery. He has received numerous awards including the Virginia wine industry’s Man of the Year and the Virginia Agribusiness Council’s Distinguished Service Award. For this presentation, Grigsby will begin by hinting at the range of meanings which, throughout history, have been associated with portrayals of flowers and floral ornament. In Asia or the West, for example, various blooms might represent one of The Four Seasons (such as Spring) or The Five Senses (smell). Portrayals of “Flower Sellers,” particularly those in ceramic form, were created for consumers from nearly all levels of society as were a stunning range of vase shapes. Some flower container shapes trace their origins to wine-related and other vessels from ancient China or classical Greece and Rome. Others, which appeared spontaneously in response to the public’s obsession with novelty, were imitated and modified for decades only to fade into oblivion. Leslie B. Grigsby, Winterthur’s Senior Curator of Ceramics and Glass, is responsible for the museum’s 22,000-plus ceramic and glass objects and their display. She began her career in the 1980’s at Colonial Williamsburg and during the 1990’s published extensively on early English ceramics. Leslie was instrumental in making the entire Winterthur Museum Collection available online and is currently working towards a major exhibition titled Dining by Design, or the Art of Furnishings the Table. The American yard has been dominated by clipped foundation shrubs, groomed lawns, and trees with mulch circles. But a revolution in design is coming inspired by the way plants grow in nature – a softer, more lush vision of niche plants filling every layer and covering the ground. Join landscape architect and writer Thomas Rainer to explore the changing face of horticulture. This talk will explore how plants fit together in nature and how to use this knowledge to create gardens that are more satisfying, more resilient, and less work. Thomas Rainer is a landscape architect, teacher, and author living outside of Washington, D.C. He is a passionate advocate for an ecologically expressive design aesthetic that does not imitate nature, but interprets it. Thomas has designed landscapes for the U.S. Capitol grounds, the New York Botanical Garden, and over 100 gardens from Maine to Florida. He is Principal with the firm Rhodeside & Harwell, teaches planting design at George Washington University, and recently published his first book co-authored with Claudia West. He is a frequent public lecturer in the U.S. and Europe. The Washington Library offers a limited number of scholarships to undergraduate and graduate students studying U.S. history, decorative arts, gardening, landscape design, historic preservation, and related fields. The scholarship will cover the cost of one ticket to the symposium ($250). Students who receive the scholarship will need to cover their own transportation to and from the symposium and their lodging. Scholarship applications are due by 11:59pm on Sunday, April 30, 2017. Guests should park in Mount Vernon visitor parking lots and enter the Library via the pedestrian gate near the four-way traffic intersection across from the Mount Vernon Inn Restaurant.